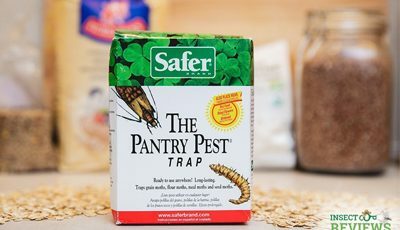 The Black Flag company is known for their insecticide products that terminates all kinds of insects and pests, but they have also made an insect fogging device – Black Flag 190095. 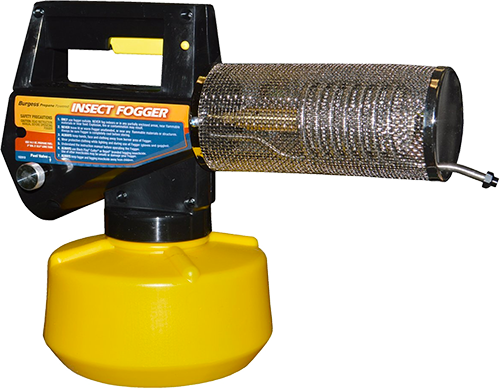 This is a thermal fogger that heats up the insecticide to produce dense fog cloud that terminates any mosquito that comes in the range of the fog. The fogger needs a propane cylinder to work. This Black Flag fogger has similar design to other thermal foggers. The body of the tool is made from a durable plastic, design is compact and the fogger is quite light, so it is easy to carry the fogger around. Black Flag fogger is portable and has got a convenient handle, so you can also fog larger areas without any problems. There are multiple triggers and valves on the fogger. As usual with thermal foggers this tool has got a fogging trigger on the handle. On the body of the fogger there is an auto ignite button. This button allows to trigger a spark which lights up the burner, so you don’t need to use a match or a lighter for lighting up the coil. However, if the auto igniter does not work you can still light it up by placing a match or a lighter to the burner. There is also a fuel control valve on the side of the fogger. By turning this valve you can increase or decrease the fuel supply. To increase the fuel supply turn the valve counterclockwise and to decrease the fuel supply or turn the fogger off completely turn the valve counter clockwise. The burner of the Black Flag fogger contains the same parts as other propane foggers. Inside you will find a coil, coil basket and a nozzle. 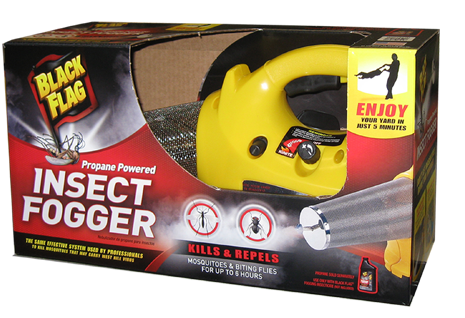 The burner heats up using the propane gas and when the insecticide gets pumped into the burner it vaporizes and sprays out as a fog. Black Flag 190095 fogger is unique from other propane foggers with the built in solution container. The container has got a hole on top of one side of the fogger where you need to fill in the insecticide or other fogging solution. The container can be sealed with a plastic cup. The container has a capacity of 32 oz (0.95 l), which is a bit less than for foggers with attachable container. 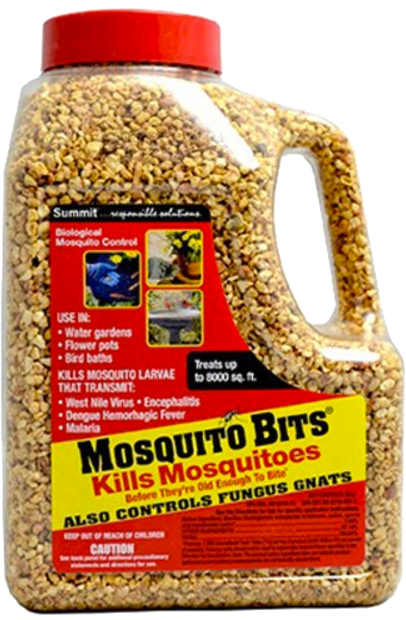 Mosquito foggers with external container usually will store over 40 oz (1.1 l) of insecticide, so you can fog larger areas without need to refill the insecticide. 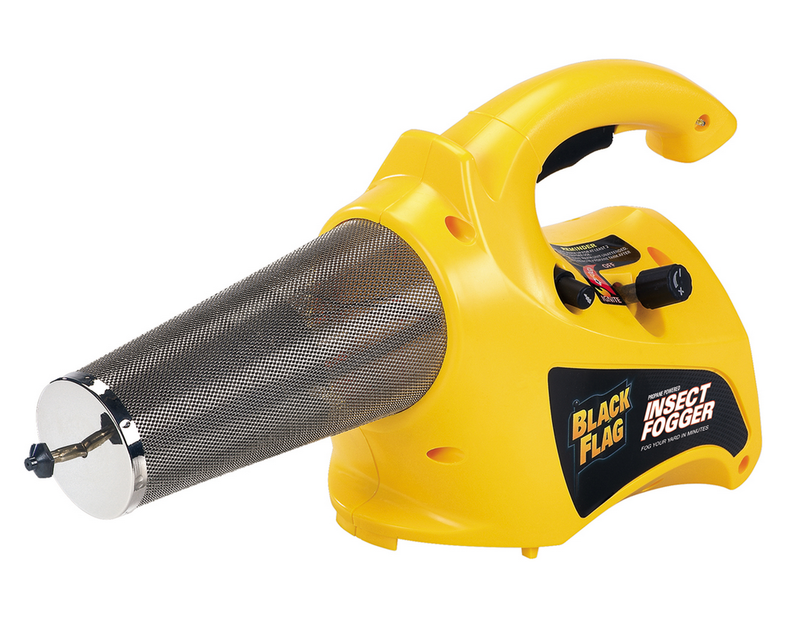 The fogging process with a Black Flag insect fogger is similar to other propane mosquito foggers. The fogger is made for outdoor usage only. 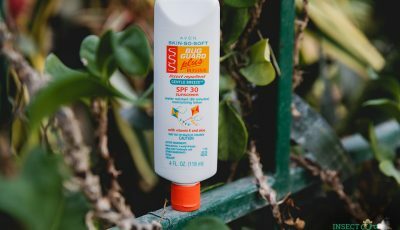 It works great for outdoor usage and will kill and repel insects for couple of hours to even days so you can enjoy bug free outdoor time. The fogger outputs approx 10 feet (3 m) large cloud of fog, so a smaller backyard can be fogged in just couple of minutes. The fog produced by the Black Flag fogger needs to be dense, in white color and have no oder, but these characteristics can differ by the type of insecticide used in the fogger. It is recommended to use the Black Flag fogger with a Black Flag insecticide to achieve the best results when fogging. The size of the Black Flag 190095 fogger is 8.3×20.3×10 inches (21×51.5×25.4 cm). The weight of the fogger with empty container is 3.6 pounds (1.6 kg). They should be able to give you more information about the product availability in Europe. Sorry to hear that. It is possible that you received a faulty unit. Have you tried contacting your seller? Fountainhead is always very customer friendly and these products do come with a warranty. Good luck! FIRST TIME TO USE MY BLACK FLAG PROPANE FOGGER THIS YEAR. PUMP TRIGGER FEELS FROZEN, DOES NOT PUMP. NO RESTRICTIONS FROM TANK TO DISCHARGE END. TRYING TO FIND A OPERATOR AND PARTS MANUAL. You can download the user manual for this product here. Have used my fogger for 3 summers now. When this one stops working I’ll buy again. Fill with mosquito killer, let it heat up and fog. Can’t get much simpler. When you’re finished let it sit with the heat on until it stops fogging, turn it off and let it cool down then store it for tomorrow evening. used my fogger in my work shop. had a fog so thick I could not see from one end to the other. did not kill one single mosquito. Could actually see them flying around in the fog. very disappointed. did the killing ingredient get taken out? Flys did not seem affected either. 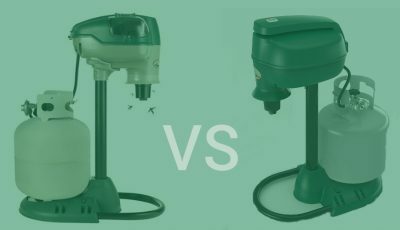 That how effective a fogger is at killing mosquitoes, flies and other insects is largely dependent on what fogging solution you are using in your device. So for me to be able to tell you the possible reasons why your fogging efforts didn’t kill the mosquitoes and flies in your area I need to know what fogging solution you used. We just bought this fogger and used the Black Flag fogging isecticide and it didn’t kill a thing! So frustrating and disappointing! Sorry to hear that, Oscar. Did you try fogging in the early morning or late afternoon, thoroughly coat all of your shrubs, trees, and lawn and reapplied the product every day to every few days? This is crucial for best results when using the Black Flag fogger and insecticide combo. 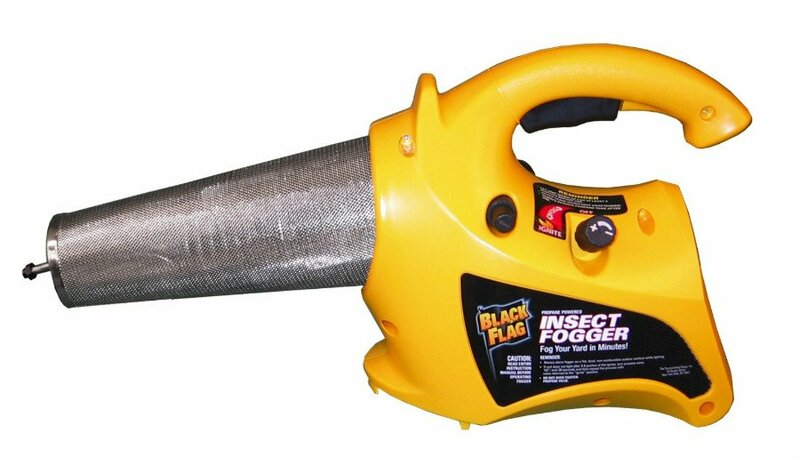 Hello, is this fogger ok to use on my child’s playground using the Black Flag insect fogger? As long as your child isn’t present when you actually do the spraying and you wait until the area is completely dry before letting your kid back into the playground it should be fine.